Power supply circuit with transformer (transformator, trafo) are still much in demand although today we have converter to convert high voltage grid (220 VAC) to a low voltage, such as 12 VDC, without transformer. One of the advantages of the power supply with transformer is the isolation of the hight voltage to low voltage,therefore it is very safe. But the transformer is big, heavy and expensive. May be in the future when high-voltage converter technology is popular and available at low price, the circuit with the transformer would be obsolete. Some electronic devices such as TV, charger for: mobile phone, laptop, etc., has no longer used transformer to supply power from grid. For circuit such as voltage step up or current step up, transformer still has no competitor. In this article discussed a variety of power supply design, from the most simple, to the one using voltage stabilization with IC. 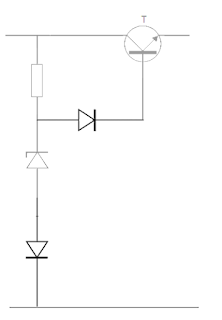 With parameters described briefly, will help you design a power supply according to your needs. 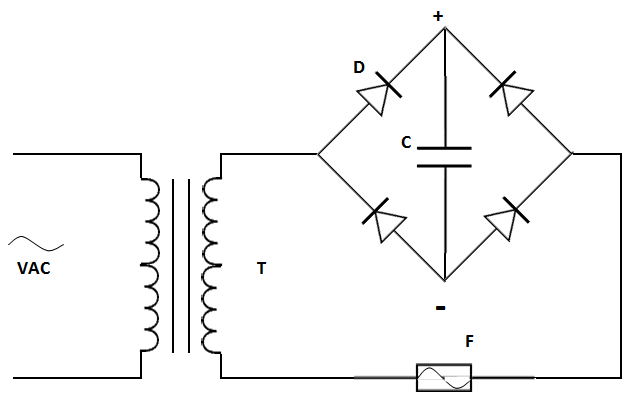 The following schematic shows a simple power supply circuit, sometimes also called an adapter. Transformer (T) which is widely available in the market have input voltages of 110 VAC and 220 VAC. The output voltage is 12 VAC and 24 VAC. While small transformer available with output voltage of 3, 6, 9, and 12 VAC. For 12 volt battery charger circuit, it needs 15 volt transformer output which is rarely available in the market but can be ordered. The amount of current needed to recharge the battery is 10% of the battery capacity. Therefore 50 AH battery requires 5 amperes charging current. Do not use a transformer with just enough current capacity, you should use the transformer with output capacity of 10 amperes to charge 50Ah battery, this way the transformer will not overheat. Read also "Charging Your Vehicle Battery". Diodes (D) convert alternating current (AC) into direct current (DC). There are 4 pieces of diodes to form a bridge to become a full wave rectifier. It could be used only one diode on that circuit, thus forming a half-wave rectifier. But since the transformer price is very expensive, it would be better if all transformer potential is used, by installing 4 pieces of diodes. 1N4007 code number is quite popular in the market with a maximum reverse voltage specification of 1000 V and a forward current of 1 A. 1N4007 diode can handle forward current up to 30 A but only in a very short time of 8.3 milliseconds. For currents greater than 0.5 amperes, usually no longer use the 1N4007. But using diode bridge that is a large 4 pieces of diodes in a single container. Diode bridge needs heatsink for large current. Download the datasheet of 1N4007. That 14.4 volts a specification recharging voltage for a wet cell battery. Some electronic gadgets are using 13.8 volts power supply such as radio communication transmitter and receiver (transceiver). Some dry cell battery has charging voltage 13.5 volts. More details about the battery in the article "Why is Battery Explode?" Condenser (C) stabilizes voltage output from diode bridge and eliminates high voltage generated by the transformer magnetic field induction. High voltage at the output of transformer is not dangerous but enough to shock if touched, because the current is weak. High voltage on the output transformer can be read by multitester if the transformer is not under load. On the battery charger, high voltage at the output can be absorbed by the battery. High voltage at the output will cause the humming and rumble (brooming) noise if the power supply is used to power amplifiers, radio transmitters, etc.. Some sensitive electronic devices can be damaged. 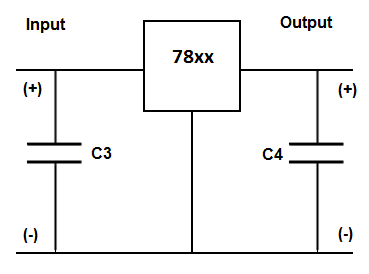 So it is needed to add filters consisting of resistors, and capacitors, or connecting the negative (-) output to ground. Usually the size of the condenser is 47 to 1000 microfarads, depending on the load. Maximum condenser voltage ise twice above the desired output voltage. For 12 volt power supply then the maximum voltage of condenser is 25 volts. Direct current output (VDC) of the above circuit is obtained at positive point (+) and negative point (-) of diode bridge. For safety reason it is necessary to add a fuse (F) with value is a little smaller than maximum current output of transformer. For big and expensive transformer, there is a fuse also fitted on the input of transformer with value is slightly smaller than the maximum input current, in order to protect that expensive transformer. 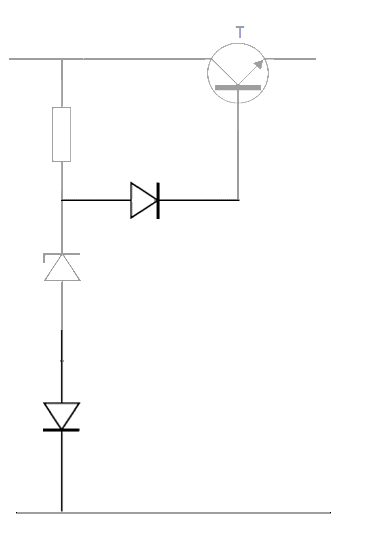 The circuit is also applied to voltage regulation with a cut-off relay which is used for wind turbine. Connect Input to the output of diode bridge. Resistor Rb supplies current to transistor (T). Rb value is 220 ohm 2 watt. This resistor determines maximum current out of the transistor (T). Zener diode (Dz) determines the output voltage of transistor. For 14.4 volt voltage of battery charger, then use Dz with value of 15 volt 2 watt. 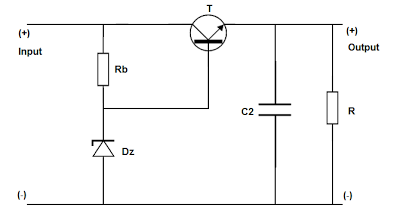 When the output voltage of base resistor (Rb) exceeds 15 volts, this zener diode will connect to the negative, so that Rb output voltage will never exceed 15 volts. As there will be voltage loss of 0.6 volts on the transistor, so a slightly higher zener voltage is choosen. Transistor (T) is a 2N3055, supply current is approximately 1.5 amperes with 220 ohm resistor basis (Rb). This transistor can handle voltage up to 60 volts and 115 watts of power and need cooler (heatsink). 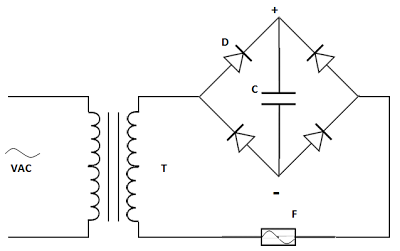 If you need a larger current then you arrange few of this transistor in parallel. Download the datasheet of 2N3055. Higher output voltage of transformer that can be used, eg 24 volts, because the output voltage of this power supply is the same as transistor output voltage which is determined by the zener voltage. 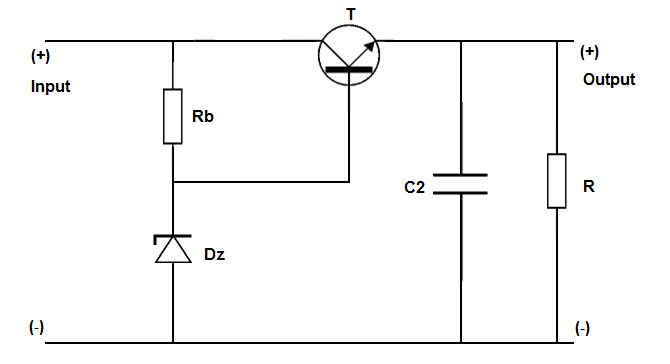 Condenser (C2) stabilizes the output voltage of transistor. Actual value will depend on the load. But in general the value of C2 about 47 microfarads can do. Voltage rating is approximately 2 times of output voltage. For 14.4 volt battery charger, condenser with maximum voltage of 25 volts is quite safe. Resistor (R) serves to secure transistor from spike voltage that is caused by induction load, such as electric motor, relay, solenoid, actuator, etc.. Resistor value is 10 kiloohm. This resistor can be eliminated if the power supply is never used to drive induction load. The circuit is very simple and has only one component, the IC only. Plus some condensers for filter: C3 0.33 microfarads, and C4 0.1 microfarads. But the regulator IC is less strong when compared with the transistor. This IC can survive up to 35-40 VDC input voltage. Rating input voltage is 23 volts and maximum output current 1 ampere for L7815A, can be supplied by 24 volts transformer. In some designs, the IC supplies to 2N3055 transistor base in order to get a larger output current. Download datasheet of IC 78xx. If a diode is installed between zener and negative, the output voltage of transistor will rise. Notice different installation of diode and zener. If the diode is mounted on the base of transistor, the transistor output voltage will drop. In the same way the diode can be used to adjust the output voltage of the IC 78xx. Installation on IC ground pin will increase IC output voltage. While diode installation on IC output pin will decrease the IC output voltage. 1N4007 diode is commonly used for voltage adjustment which has voltage of 0.6 volts. Crystal diode such as OA90 has voltage of 0.2 volts, also called germanium diode. Greetings from Colorado!I'm bored to death at work so I decided to browse your site on my iphone during lunch break. loaded on my mobile .. I'm not even using WIFI, just 3G .. Anyways, good site! Minimalist template design is the key for an easy access. Hope my blog would cure your boredom. It is actually my cloud data, but everybody can read it. Thanks for visiting my blog. Rgs, Heru.